For the album, see Aeronautics (album). For the company, see Aeronautics Defense Systems. While the term originally referred solely to operating the aircraft, it has since been expanded to include technology, business, and other aspects related to aircraft. The term "aviation" is sometimes used interchangeably with aeronautics, although "aeronautics" includes lighter-than-air craft such as airships, and includes ballistic vehicles while "aviation" technically does not. A significant part of aeronautical science is a branch of dynamics called aerodynamics, which deals with the motion of air and the way that it interacts with objects in motion, such as an aircraft. Attempts to fly without any real aeronautical understanding have been made from the earliest times, typically by constructing wings and jumping from a tower with crippling or lethal results. Wiser investigators sought to gain some rational understanding through the study of bird flight. An early example appears in ancient Egyptian texts. Later medieval Islamic scientists also made such studies. The founders of modern aeronautics, Leonardo da Vinci in the Renaissance and Cayley in 1799, both began their investigations with studies of bird flight. Man-carrying kites are believed to have been used extensively in ancient China. In 1282 the European explorer Marco Polo described the Chinese techniques then current. The Chinese also constructed small hot air balloons, or lanterns, and rotary-wing toys. 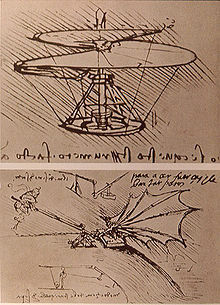 In the late fifteenth century, Leonardo da Vinci followed up his study of birds with designs for some of the earliest flying machines, including the flapping-wing ornithopter and the rotating-wing helicopter. Although his designs were rational, they were not based on particularly good science. Many of his designs, such as a four-person screw-type helicopter, have severe flaws. He did at least understand that "An object offers as much resistance to the air as the air does to the object." (Newton would not publish the Third law of motion until 1687.) His analysis led to the realisation that manpower alone was not sufficient for sustained flight, and his later designs included a mechanical power source such as a spring. Da Vinci's work was lost after his death and did not reappear until it had been overtaken by the work of George Cayley. The modern era of lighter-than-air flight began early in the 17th century with Galileo's experiments in which he showed that air has weight. Around 1650 Cyrano de Bergerac wrote some fantasy novels in which he described the principle of ascent using a substance (dew) he supposed to be lighter than air, and descending by releasing a controlled amount of the substance. 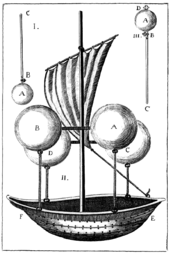 Francesco Lana de Terzi measured the pressure of air at sea level and in 1670 proposed the first scientifically credible lifting medium in the form of hollow metal spheres from which all the air had been pumped out. These would be lighter than the displaced air and able to lift an airship. His proposed methods of controlling height are still in use today; by carrying ballast which may be dropped overboard to gain height, and by venting the lifting containers to lose height. In practice de Terzi's spheres would have collapsed under air pressure, and further developments had to wait for more practicable lifting gases. From the mid-18th century the Montgolfier brothers in France began experimenting with balloons. Their balloons were made of paper, and early experiments using steam as the lifting gas were short-lived due to its effect on the paper as it condensed. Mistaking smoke for a kind of steam, they began filling their balloons with hot smoky air which they called "electric smoke" and, despite not fully understanding the principles at work, made some successful launches and in 1783 were invited to give a demonstration to the French Académie des Sciences. The Montgolfier designs had several shortcomings, not least the need for dry weather and a tendency for sparks from the fire to set light to the paper balloon. The manned design had a gallery around the base of the balloon rather than the hanging basket of the first, unmanned design, which brought the paper closer to the fire. On their free flight, De Rozier and d'Arlandes took buckets of water and sponges to douse these fires as they arose. On the other hand, the manned design of Charles was essentially modern. As a result of these exploits, the hot-air balloon became known as the Montgolfière type and the hydrogen balloon the Charlière. Charles and the Robert brothers' next balloon, La Caroline, was a Charlière that followed Jean Baptiste Meusnier's proposals for an elongated dirigible balloon, and was notable for having an outer envelope with the gas contained in a second, inner ballonet. On 19 September 1784, it completed the first flight of over 100 km, between Paris and Beuvry, despite the man-powered propulsive devices proving useless. In an attempt the next year to provide both endurance and controllability, de Rozier developed a balloon having both hot air and hydrogen gas bags, a design which was soon named after him as the Rozière. The principle was to use the hydrogen section for constant lift and to navigate vertically by heating and allowing to cool the hot air section, in order to catch the most favourable wind at whatever altitude it was blowing. The balloon envelope was made of goldbeater's skin. The first flight ended in disaster and the approach has seldom been used since. Sir George Cayley (1773-1857) is widely acknowledged as the founder of modern aeronautics. He was first called the "father of the aeroplane" in 1846 and Henson called him the "father of aerial navigation." He was the first true scientific aerial investigator to publish his work, which included for the first time the underlying principles and forces of flight. He introduced the use of the whirling arm test rig to investigate the aerodynamics of flight, using it to discover the benefits of the curved or cambered aerofoil over the flat wing he had used for his first glider. He also identified and described the importance of dihedral, diagonal bracing and drag reduction, and contributed to the understanding and design of ornithopters and parachutes. Another significant invention was the tension-spoked wheel, which he devised in order to create a light, strong wheel for aircraft undercarriage. During the 19th century Cayley's ideas were refined, proved and expanded on. Important investigators included Otto Lilienthal and Horatio Phillips. Pedro Paulet, scientist born in the city of Arequipa, Peru in the year of 1874, was one of the first to experiment with propulsion rockets being considered the «Father of Modern Rocket» and by others as the «Father of Aeronautics Modern ». He developed plans for a "torpedo plane", which is why he is considered ahead of his time. When the internal explosion engines were invented, small enough to be able to propel a flying device with them, a race started between two flight possibilities: the lighter than the air (dirigibles) and the heavier than the air (aeroplanes) . Aeronautics may be divided into three main branches comprising Aviation, Aeronautical science and Aeronautical engineering. Aviation is the art or practice of aeronautics. Historically aviation meant only heavier-than-air flight, but nowadays it includes flying in balloons and airships. Aeronautical science covers the practical theory of aeronautics and aviation, including operations, navigation, air safety and human factors. A candidate pilot is likely to study for a qualification in aeronautical science. Aeronautical engineering covers the design and construction of aircraft, including how they are powered, how they are used and how they are controlled for safe operation. A major part of aeronautical engineering is aerodynamics, the science of passing through the air. 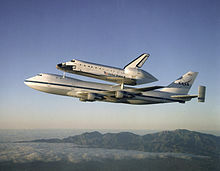 With the increasing activity in space flight, nowadays aeronautics and astronautics are often combined as aerospace engineering. The science of aerodynamics deals with the motion of air and the way that it interacts with objects in motion, such as an aircraft. Incompressible flow occurs where the air simply moves to avoid objects, typically at subsonic speeds below that of sound (Mach 1). Compressible flow occurs where shock waves appear at points where the air becomes compressed, typically at speeds above Mach 1. Transonic flow occurs in the intermediate speed range around Mach 1, where the airflow over an object may be locally subsonic at one point and locally supersonic at another. 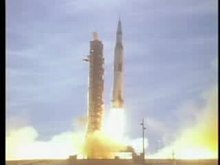 Launch of Apollo 15 Saturn V rocket: T - 30 s through T + 40 s.
A rocket or rocket vehicle is a missile, spacecraft, aircraft or other vehicle which obtains thrust from a rocket engine. In all rockets, the exhaust is formed entirely from propellants carried within the rocket before use. Rocket engines work by action and reaction. Rocket engines push rockets forwards simply by throwing their exhaust backwards extremely fast. Rockets for military and recreational uses date back to at least 13th-century China. Significant scientific, interplanetary and industrial use did not occur until the 20th century, when rocketry was the enabling technology of the Space Age, including setting foot on the moon. Chemical rockets are the most common type of rocket and they typically create their exhaust by the combustion of rocket propellant. Chemical rockets store a large amount of energy in an easily released form, and can be very dangerous. However, careful design, testing, construction and use minimizes risks. ^ a b Aeronautics. 1. Grolier. 1986. p. 226. ^ a b c Wragg 1974. ^ Wragg 1974, pp. 10–11. ^ Wragg 1974, p. 11. ^ Fairlie & Cayley 1965, p. 163. ^ Ege 1973, p. 6. ^ Ege 1973, pp. 97–100. ^ Ege 1965, p. 105. ^ "Sir George Carley". Flyingmachines.org. Archived from the original on 2009-02-11. Retrieved 2009-07-26. Sir George Cayley is one of the most important people in the history of aeronautics. Many consider him the first true scientific aerial investigator and the first person to understand the underlying principles and forces of flight. ^ Cayley, George. "On Aerial Navigation" Part 1 Archived 2013-05-11 at the Wayback Machine, Part 2 Archived 2013-05-11 at the Wayback Machine, Part 3 Archived 2013-05-11 at the Wayback Machine Nicholson's Journal of Natural Philosophy, 1809–1810. (Via NASA). Raw text Archived 2016-03-03 at the Wayback Machine. Retrieved: 30 May 2010. ^ Aeronautical engineering Archived 2012-07-27 at the Wayback Machine, University of Glasgow. ^ Sutton, George (2001). "1". Rocket Propulsion Elements (7th ed.). Chichester: John Wiley & Sons. ISBN 978-0-471-32642-7. Fairlie, Gerard; Cayley, Elizabeth (1965). The life of a genius. Hodder and Stoughton. Wragg, D.W. (1974). Flight before flying. Osprey. ISBN 978-0850451658. Wikisource has the text of the 1911 Encyclopædia Britannica article Aeronautics. Look up aeronautics in Wiktionary, the free dictionary. "Aeronautics and Astronautics". MIT OpenCourseWare. Massachusetts Institute of Technology. Ilan Kroo. "Aircraft Design: Synthesis and Analysis". Stanford. "Beginner's Guide to Aeronautics". Glenn Research Center. NASA. "Home page". American Institute of Aeronautics and Astronautics. "Ideas in Aeronautics & Air Transport". Wiki. Advisory Council for Aeronautics Research in Europe.